Covering the Tamworth and Lichfield area, C Pages Web Design is based 3 miles from the centre of Birmingham in the West Midlands. Our Birmingham based web designers offer an affordable website design service to predominantly small to medium sized Tamworth and Lichfield businesses looking to tap into the benefits of promoting their businesses over the Internet. C Pages offer both local and national search engine optimisation for businesses in the Tamworth and Lichfield area wanting to grow their internet enquiries with prominent website listings in the major search engines including Google. Here are a few examples of some of the websites we have completed for our clients in the Tamworth and Lichfield area. Based in Lichfield, MDC Carpentry specialises in the refurbishment and replacement of staircases and stair parts covering the Birmingham, West Midlands and Staffordshire areas, offering a total finish service including painting and staining. 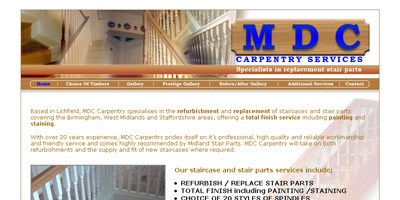 With over 20 years experience, MDC Carpentry prides itself on it’s professional, high quality and reliable workmanship and friendly service and comes highly recommended by Midland Stair Parts. MDC Carpentry will take on both refurbishments and the supply and fit of new staircases where required. Welcome to the Lewis Mini Travel web site. We specialize in a complete 16 seater minibus hire service covering the Tamworth and surrounding areas. 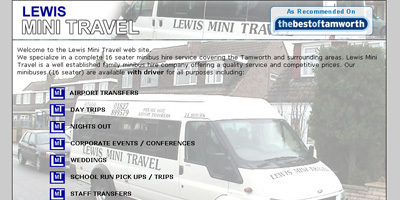 Lewis Mini Travel is a well established family minibus hire company offering a quality service and competitive prices. Our minibuses (16 seater) are available with driver for all purposes.